The arresting feeling that you experience when standing atop a mountain is difficult to describe; a sense of bewilderment washes over while you try to fathom the geological forces needed to create the endless peaks jutting into the horizon. Add to this a sense of mighty accomplishment; getting to such a spot involves not only hiking, but climbing too, requiring you to stare at walls of rock and the tense knuckles of your hands as you pull yourself over the final ledge. This is how it feels to be standing atop the peak of T2 at Kicking Horse Mountain Resort in British Columbia. 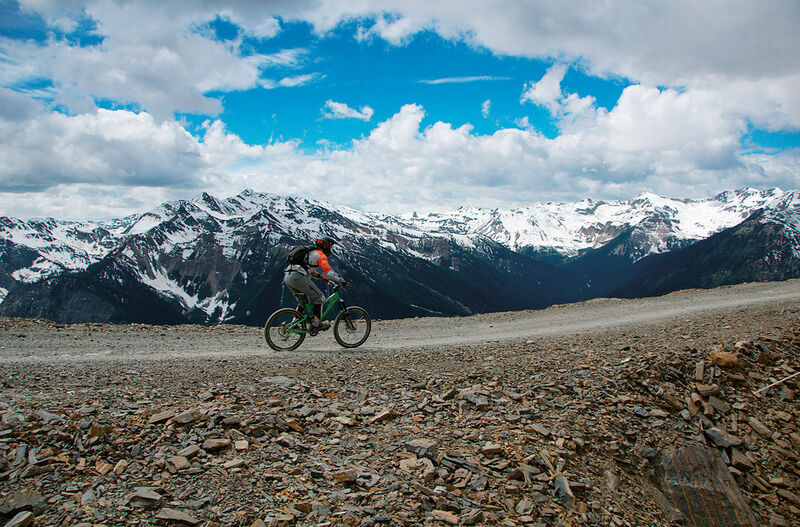 One of only a few multiseasonal resorts and home to the third-largest vertical drop in Canada, Kicking Horse has long been a mecca for skiers, snowboarders, hikers, and downhill mountain bikers alike. The resort is a two-and-a-half-hour drive west of Calgary, on the outskirts of Golden in the Purcell Mountains on the Dogtooth Range—named for the area’s jagged peaks that bite into the sky. For those less enthused about a long hike, the Golden Eagle Express gondola whizzes guests upward to the 2,450-metre summit, passing over the 22-acre bear conservation refuge—the largest of its kind in the world—that has been home to Boo the grizzly since he was orphaned in 2002. One of the best ways to enjoy the captivating views at the top is at the award-winning Eagle’s Eye Restaurant, Canada’s highest-elevation restaurant, which allows guests to experience fine dining while still wearing their dusty hiking shoes or dripping wet ski boots. Expansive windows provide uninterrupted views of five national parks while visitors experience a menu that combines the best of fresh Okanagan produce with rustic mountain fare (think elk tenderloin). For those who wish to spend a night at the top of the world, the lodge also has two private suites that can be booked (and include a butler and chef), which allows guests to wake the next morning to a summer sunrise or first tracks in the winter. Rumours of an upcoming season blessed with higher-than-average snowfall—courtesy of La Niña—have lovers of the resort’s champagne powder awaiting in anticipation. With over 2,800 acres of skiable terrain, there is an experience for every level. The newly opened Super Bowl area allows guests to visit in the winter, tackle T2 (or the sister peak, Terminator), then ski down over 15 runs of backcountry-esque skiing in a patrolled and avalanche-controlled environment. And starting this winter, Kicking Horse is partnering with one of the region’s oldest tour operators, Brewster Travel Canada, to offer daily transfers to and from Calgary International Airport. There is no shortage of on-mountain lodgings, yet to fully appreciate a true mountain experience, there are about 20 private residences available for rent, the majority of which are run by Lush Mountain Accommodations. These luxurious homes are equipped with everything needed to relax after a busy day on the slopes, along with more than a few extras, like steam rooms, games tables, and hot tubs. Just be prepared for the mountain lifestyle to take hold, with desires to conquer the peaks again the next day.